Local bronze sculptor Gerard Stripling took on an unusual project this week, restoring the oldest work of public art in the city’s collection. 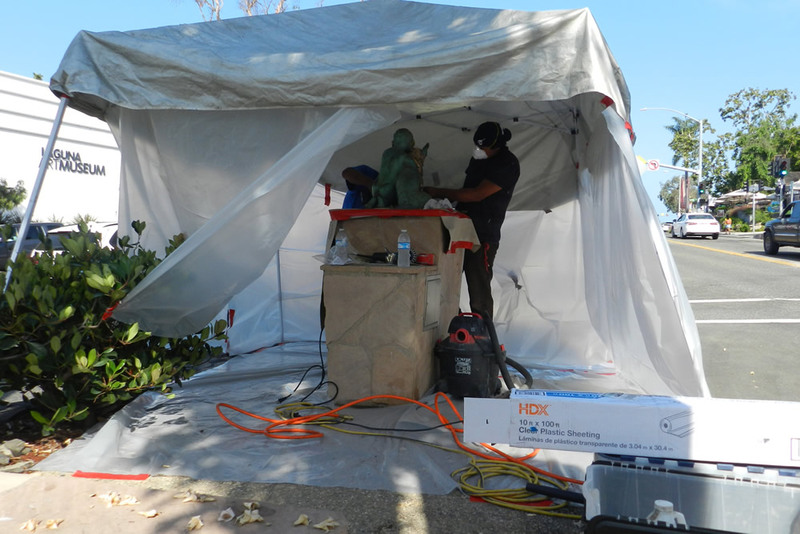 Vandals doused “Boy and Dog,” a pint-size bronze sculpture by Ruth Peabody, located on a flagstone pedestal near Jahraus Park in North Laguna. A liquid of undetermined type has hardened and eaten into the patina that coats and protects the bronze sculpture from the elements, said Siân Poeschl, the city’s cultural arts manager, who discovered the vandalism July 1. Stripling is trying to clean off the foreign substance on-site to avoid having to remove the sculpture to a foundry for restoration, she said. The process generally involves heating the bronze and reapplying the patina, which protects the multiple metals melded to make bronze. Poeschl oversees a 100-piece collection that enriches public and private spaces. The same work was vandalized and restored in 2008 by another local sculptor, the late Cheryl Ekstrom, Poeschl said. Both Ekstrom and Stripling received commissions for bronze sculptures included in the city’s collection. Ekstrom also removed the sculpture’s patina, but also rebuilt an arm that had deteriorated due to contact with an interior metal pipe that carried water. Water lines were replaced with plastic ones, but conservation measures led to turning off the water feature. 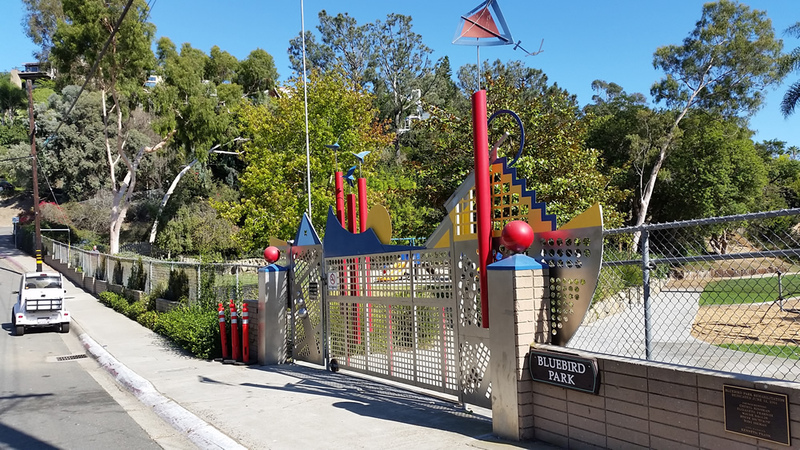 Repairs are also underway on Jon Seeman’s Bluebird Park gate, “High Flying.” Photo courtesy of Sandy Toes and Popsicles blog. “We’re trying to make sure the piece is really taken care of,” said Poeschl, noting other collection restoration work underway on a turtle sculpture and gate, both in Bluebird Park. 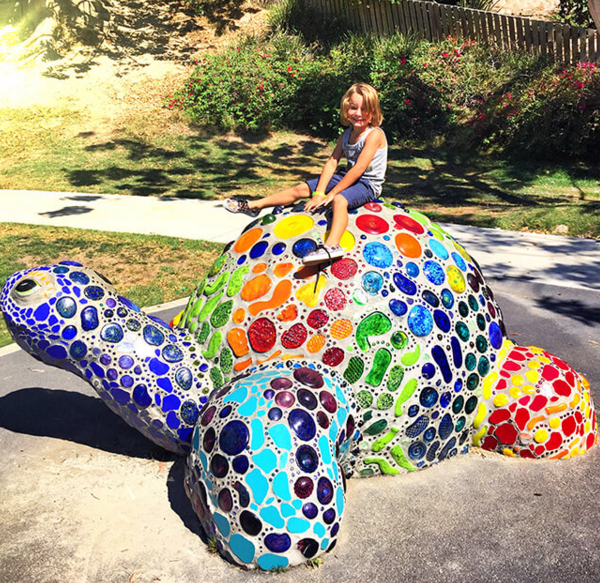 City workers are currently repairing some of the glass inserts in the well-loved Bluebird Park turtle made by Michele Taylor, part of on-going maintenance of the city’s public art collection.Photo courtesy of Sandy Toes and Popsicles blog. “It’s rare for us to have vandalism,” she said. Another act of vandalism destroyed a mural outside the Sawdust Festival earlier. The Peabody work currently under restoration was created for Sophie Kerr in memory of her daughter, according to Poeschl. “I don’t know when it was changed to ‘Boy and Dog’.” Somewhere along the way, someone unintentionally retitled the work. Poeschl said she received a letter years ago from the female model, who took umbrage over the misidentification. Peabody and her mother, Eleanor Coburn, were two of the city’s earliest prominent female artists, who had moved from Illinois to Laguna Beach in 1924. Poeschl encouraged anyone with information about the vandalism to report it to the Police Department.